I told some of my employers over the years, but then again, I told everyone after they got to know me except for one. In fact, that person, even knowing, hired me on the spot. I have lost friends because of my illness. I have lost the chance of becoming friends with people because they judge me and choose to not get to know me because I have told them I have a mental illness. So, over the past two months, I have decided that if someone chooses not to be my friend because I have bipolar disorder, that is their loss. I would rather tell them in the beginning and find out right away that they want nothing to do with me because of my illness than waiting until I have sunk so much into the relationship. I feel this will prevent me from getting hurt too. When I started Bipolar Bandit’s Facebook, Twitter, blog, and Pinterest board, I did it anonymously. I now have put my own picture on there. I actually did this after someone pointed out that I might be taken more seriously if I had my own picture on there and my emails came from a person. Therefore, I also changed my email address too. I am proud of all the things that I have accomplished in my life even though I suffer from a serious mental illness. I feel blessed that God has given me the chance to help others and advocate for the mentally ill. This confirmed to me that I do not belong at that church. I actually had done my testimony at that church one time and talked about my mental illness. The theme of the testimony was how we all wear masks and how God wants us to take off our masks. Everyone has problems in their lives and what good does it do to hide them? God wants us to share what we face and have overcome. I, after explaining all that I accomplished in my life, said and now I am going to remove my mask. That was when I said I had suffered from a mental illness since I was 13 and was diagnosed at 17. If you have read this whole thing, I challenge you to take off your mask to someone. I wouldn’t suggest doing it to an employer if you are doing it for the first time. Tell a family member or close friend or perhaps tell someone you just met. I have been blessed with a close family who has stood by me over and over again through all my hard times. I also have been blessed with some great friends who have accepted me for who I am. This entry was posted in Uncategorized and tagged bipolar disorder, mental illness, who should i tell?. Bookmark the permalink. I agree with you in regards to your employers. The same goes for just about anybody I tell. I feel like even if they accept me for who I am, they will still treat me differently or act differently around me. Good job for you, too, when you decide to take your mask off. Let me know how it goes. Another small thought. 🙂 You said that sometimes when you tell people, they are surprised and say that they think you’re “normal”. That happened to me too with a friend. But she said it in a negative way, like: “there’s nothing wrong with you, you’re imagining it, overreacting,…” I hate the fact that it’s so hard to explain to people that you can in fact have a mental illness without being completely, utterly, totally crazy. Why is that so hard to accept for people? Any experience with that? Thanks for your encouraging words regarding that I am brave. I still hope I am doing the right thing and am still kind of scared to tell people. However, I am going to try it that way for awhile. The worst that could happen is I lose some of the people in my life, but as I said, those people should not matter to me anyway. 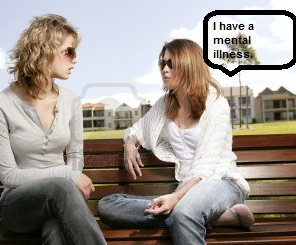 Fortunately, the people who know I have a mental illness know what it is all about. I usually talk about examples of things I have done,etc. I was blessed that my mom went into psychiatric nursing after I was diagnosed to learn as much as she could about my illness. I have one sister who thinks I make it all up to get attention. She is not supportive of my illness and refuses to talk about it or be around me when I am manic. My other sister is a god send who has always been very supportive and comes to my aid when I need it. She has also tried to educate herself about my illness. I have a boyfriend who has seen me at my worst (10 day hospitalization) and he is still my rock and stands by me and loves me for who I am. I hear people say what you are saying all the time; about people saying that there is nothing wrong with you. I guess I have been lucky that for the most part, everyone at least believes me. The people who refuse to listen and believe that you suffer from such a devastating illness are ignorant, I believe. They are almost as bad as those people who turn their backs on “the crazy people”. I am so happy for you that you have so many people who stuck by your side! That’s also what keeps me going. My boyfriend also stays by my side, just like you throughout hospitalization, anger fits, depression,… The same goes for my parents and brothers, they really try to understand. But friends don’t. I am a type 2 bipolar -well, to be honest I am not completely diagnosed yet- so my symptoms are not that obvious. And the only people that see me at my worst are my boyfriend and close family, so for friends it just seems like I’m making it up, cause they only get to see me when I’m doing fine. I for one say good for you. You didn’t ask for this and you should not be ashamed of it. I have a friend who has a down syndrome chil although its a mild case and knows it. She refuses to acvcept it. My theory is if you feel the need to hide it then you are ashamed and thats what is shameful to me. I have a son whom was born with a birth defect and I love him with all that I am. I have raised my kids to stand up for the kids at school that are being bullied for being “different” and to befriend them, they have! I say rock on girl! Thanks Sarah for sharing about your friend and son. Thanks for your encouragement, too. It means a lot that someone from high school would comment on my blog. I wondered about you putting your pic up. That is awesome!! I am proud of you.. If people are different than anyone with Cancer, diabetes or mental illness. People will walk away. When someone is different for whatever reason some people just can’t handle it. I am putting it out there that I am Bipolar too. I have been rejected my whole life not because people knew I had it. I was rejected because of my behavior (Bipolar). Before I knew I had it I couldn’t figure out why I couldn’t keep friends. I seem to always say the wrong things. I feel now that if they know ahead of time like you said then that will save time and pain. It is a part of me I can’t change it, really it is what makes me me. I am very proud of you for all you have accomplished and you educating us on Bipolar. I have learned so much since I found you on pinterest. As I learn and understand Bipolar I am better able to take control. I have learned to know what triggers depression and mania. I have learned I am not crazy! It is an illness. Like any other. Thanks Kalie for the kind, encouraging words. I have not known you very long, but consider you a friend. I am so glad we crossed paths. Good for you! How awesome and brave that you have revealed your mental illness. I started my blog anonymously, but I recently put my real name and picture on it. I don’t need to be ashamed, and neither do you. God made all of us the way He wanted. As far as that church goes, it’s a shame when people who claim to love God are so hurtful and judgmental. I’ve had issues like that myself. Thank you, Meagan. I’m not ashamed and don’t think I ever really was. I am, however, bothered by the things I do while I am manic and have been embarrassed by those. However, there is no going back, so I keep looking to the future. It is people like you, who are up front about their illness who are brave. I have always admired people who share they have a mental illness and don’t have to hide behind anonymity. Oh, don’t say people like me! LOL I haven’t been upfront about my illness to really anyone. It’s only been recently that I felt comfortable putting my picture on my WordPress site. I am trying to be more open, though. One step at a time, I suppose. I am not on Facebook. I deactivated my account due to so much family drama. Facebook always depressed me. I had so many “friends” on there, but no one who actually cared about me or really wanted to talk to me. I’ll keep reading your blog. I’m so glad I found it! Good for you! I am slowly reaching the point of being able to tell others about my mental illnesses. It’s easier for me to do in writing than in person, though. I, too, have heard the resounding sound of silence to some of my FB comments and links. It’s a process, I think. And those who don’t want to have anything to do with me because I have mental illness–well, that’s OK.
Fighting the stigma attached to mental illness is a hard thing to do, I have learned. I wish you the best of luck in telling people about your mental illness. It sounds like you have a healthy attitude regarding the people who won’t accept you for who you are. It is one of those things that is easier said than done for me: not caring what others think or letting go of a relationship because they judge me because I have a mental illness. First of all, i admire your courage. It’s not easy to always wear a mask (figurely speaking, ofcourse :-)). I’ve been diagnosed with Bipolar Disorder and ADD very late in life (at age 45), after a life of struggling. That’s 5 years ago and it was a turningpoint in my life. Now, on meds and with a lot of help from a local mental health organisation, for the first time in my life, i have the feeling i have a somewhat meaningfull life. I know lots of people, all from within this health-organisation (that feels safe for me), and even have a few real friends … and a girlfriend now. But from the past, except for my family, there is no-one left. So, to the outside world, i have no problems and i’m just this nice happy (sometimes silly) man. I probably still have a long way to go, but i’m sure that one day, i’ll be confident enough to lower my mask. Well done and congrats. This is an issue I recently faced and after tossing it around for months I went the same way as you. Hi everyone, this is me! Don’t like it? Too bad, your loss not mine.